Will the introduction of an attractive, interactive, informative portal which embeds Web 2.0 social networking technologies improve the information and digital literacy skills of our students, provide students with the necessary graduate skills for work and improve the overall student experience? We then introduced the new portal, demonstrating how we were planning on moving from a static website to a content management system that provided interactivity. In this new portal, users can comment on the information, rate resources, suggest links, give feedback via polls and mini surveys, contact us via SMS, Twitter, Skype and Facebook and use the online bookings and appointments system to book the group study room or an appointment with a member of staff. We showed how the digital literacies of students can be improved by introducing them to the use of Web 2.0 technologies which are embedded in the guides via RSS feeds, podcasts, videos, tag clouds, web-links, links to resources in the Library – see, for example, the Research Skills guide, which brings all the blog posts relevant to researchers on the welcome page, and the Readings page for the CDR (Conceptualising and Designing Research) module, which highlights the resources (readings, new books, video, web links etc) for the lecture by Paul Standish on the philosophical perspectives of education. 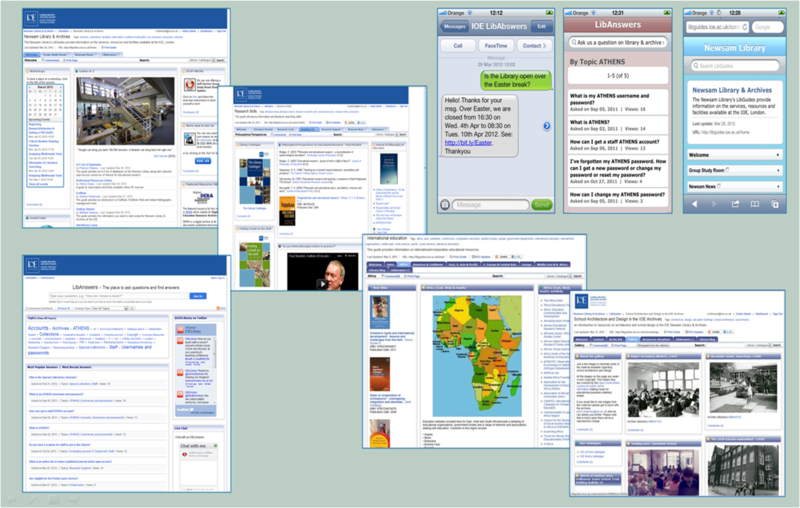 Students can also develop new digital literacy skills such as learning how to keep current with research, see for example, the guide RSS: Keeping current with your research, learn about the different bibliographic management tools, EndNote, Mendeley and Zotero (the latter two LibGuides also highlight the opportunities to network with researchers world-wide using the inbuilt social networking technologies) and peruse the AV Resources Online guide which provides students with the opportunity to view some of the resources that are freely available on the Internet to develop their teaching materials. Students can now access quality resources recommended by librarians which are more appropriate for academic use than those that are found via search engines such as Google and sites such as Wikipedia and YouTube. This, it is hoped, will improve the information literacy of our students. Examples of the guides that point students to quality resources are the Databases A-Z guide which provides easy access to all the bibliographic indexes available to students at the IOE and via Senate House Libraries; the two guides highlighting our archive collections, School Architecture and Design and LGBT resources which provide an insight into the historical collections at the Newsam Library, and the guide on International Education which aggregates all the collections relevant to this area of research. There is clearly more work to be done in collating information resources under general headings such as, for instance, the History of Education, the Philosophy of Education, Educational Technologies etc. These are considerations that are under discussion and your views would be welcome. A demonstration of LibAnswers showed how students, whether full-time or part-time, whether based in the UK or abroad, can obtain detailed responses to their questions, and to interact with expert staff online using the online portal, SMS or social networking tools such as Twitter, Facebook, Chat and Skype. Students will also be able to browse frequently asked questions and find answers for questions that have already been asked by other students. The fact that the library would be able to inform students immediately of new resources, service issues etc. was something that we also highlighted – this is not possible using the current content management system. Further, the inclusiveness with respect to bringing together expertise, whether it is library and archives based or within the faculties was something that we also highlighted as a possibility. The teaching staff that were present were keen to work with us in developing, for instance, the reading lists and recommending resources that they would like their students to be aware of, in addition to course readings. The audience at our two presentations (as we repeated the session at lunch time) were impressed by the portal and the fact that the portal is mobile friendly enabling students and staff to access both LibGuides and LibAnswers on the go, on their mobile (SMART) phones or other hand-held devices such as the iPAD. Much work needs to be done in developing the portal further for a launch at the start of the new academic year and we would be grateful for your feedback. A poll on the home page (bottom right-hand corner) provides this opportunity to answer the question posed above. Please do let us know what you think at http://libguides.ioe.ac.uk or post your comments below. This entry was posted in Research Support and tagged digital literacy, information literacy, information portal, Learning & Teaching conference, LibAnswers, LibGuides, mobile devices, mobile phone. Bookmark the permalink.